Jake’s Moving and Storage are licensed, bonded, and insured professional movers in Fairfax County, Virginia. Based in Potomac, MD for over a decade, we have increased our value as moving company by providing competitive flat rate quotes along with sharp and skilled movers. We provide our clients the best support by offering consistent flat rates and using affordable, trustworthy, and efficient movers for local and interstate moves out of Fairfax County. Our complete moving service can help with relocation services for residents of Virginia, Washington D.C., Maryland, and surrounding areas. We provide a full service move to those who require packing and unpacking, moving, and storage. We complete interstate and intrastate or local moves for residential, industrial, and commercial customers. We disassemble, assemble, and arrange furniture and equipment to assist in the move process. 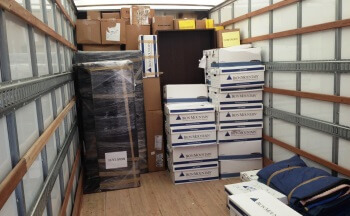 Extra care is taken to move heavy, big, and valuable pieces such as moving pianos, antiques, and artwork. If required, we can provide safe short or long term storage for belongings including vehicles storage and business files. When you’re planning a local move in Maryland, Washington D.C., Virginia, we are not only flat rate movers providing competitive, no surprises prices. We understand all relocation, including moving within Virginia can be difficult. When you hire us we want your experience to be fun, so we make sure our staff is always fast and friendly, professional movers. We only use experienced packers, so if you use our packing service, your items are treated with the utmost care. We have experience with the complexity of relocating offices. Down time for your operations must be minimal, limiting the business’ interruption. We work around your regular schedule for the move, understanding that not being closed for extended periods of time enables retail businesses, private offices, and government offices to maintain their customer satisfaction ratios. Using practiced expertise, we successfully move conference tables, filing cabinets, record storage, safes, medical equipment and modular furniture installations. We also complete installations at the new location. If needed, we have storage services available and we also remove and dispose of unusable equipment and furniture. Individuals and families have several types of items they want move; consequently, we have become specialized moving company of furniture pieces including antiques, artwork, electronics, home office equipment, home gyms, and sports equipment. If needed, we will disassemble items to move them and reassemble them after the move. Another service we provide is Fairfax County junk hauling. We understand with so many factors to consider, moving even locally can be nerve racking. By being a trustworthy and reliable professional moving service, we can help removing some of the hassle concerning your move across the city or across country. We strongly believe that our quoted price should be binding. Jake’s Moving and Storage provides upfront prices, and an all-inclusive flat rate with no unpleasant surprises. Our Pricing is based on the time needed getting the job done. Everything is calculated including time spent packing, packing supplies used, loading, transporting, unpacking, furniture assembly and disassembly, driving, and any further services. All pricing includes a minimum of three hrs of labor and one hr of travel time; however, our prices will change in some instances involving very small moves or moving items in-home. Contact our agents for more information. Our Team is able to help you 24 hours a day, 7 days a week with any questions you may have. To ensure your prized possessions reach your new destination safely, our skilled packers will take extra care boxing and wrapping your possessions. Our team will use the proper packing materials for dishes, artwork, books, and clothing. All breakable goods will receive special care and will be secured with shrink wrap, protective foam, and bubble wrap for safe transport. Both a packing and unpacking service is available for all moves. Pianos, antiques, expensive furniture, and collectibles will be handled with the appropriate care required to preserve their original condition during transport. Or if you prefer, we’ll provide you with all the needed packing supplies for you to pack yourself. Jake’s Moving and Storage is your go-to professional moving company for Washington D.C., Maryland, Virginia, and surrounding areas. As movers in Fairfax County Virginia, we regularly and successfully complete commercial moves, industrial moves, and residential moves. Working in this densely populated region has resulted in countless satisfied customers and we look forward to adding you to that number in the future. Our Fairfax County VA Moving Services https://jakesmoving.com/va/fairfax-county/ 4.5/5 based upon 8 reviews.